The Autumn Winter 17 Menswear collections offergreat style, fit and quality for our customers.The collections focus on stylish wardrobe essentials, sharp fitting suits and quality footwear and accessories. Urban Simplicity combines the relaxed aesthetic of sports luxe, and the sharp look of pared back tailoring, in a classic colour palette of indigo and grey. Layering is key, with standout pieces including the Savile Rowe Inspired Check Suit and the statement padded Blue Harbour coat. Autumn Winter will see the second seasonof the M&SActivewhich includes jogging bottoms, t-shirts and hoodies.The collection has been designed in a coordinating monochrome colour palette with pops of cherry red and cobalt blues, and with innovations such as moisture wicking fabrics to keep you fresh and dry, and reflective trims for visibility. Tailoring is updated with contrast satin lapels, Nep textures and matching suits and bow ties. Elegant velvet formal jackets in navy, black and burgundy offer a bold look for occasions, whilst the royalblue Limited Edition suit with narrow lapels, super slim fit and shorter length is a reworked classic. Over 150 suits are available in up to four fits, in over 100 sizes. Wool offers the perfect pairing of style and warmth, andremains a key fabric for Autumn Winter. Standout pieces forthe new season include theM&S Collection navy roll neck and the Limited Edition suit worn with an M&S Collection skinny burgundy tie. Tone and Texture are important design details of the Autumn Winter collections. Rich textures are used throughout including, Nep and Donegal across suiting, cashmere and cable knitwear, and faux fur and shearling trims. 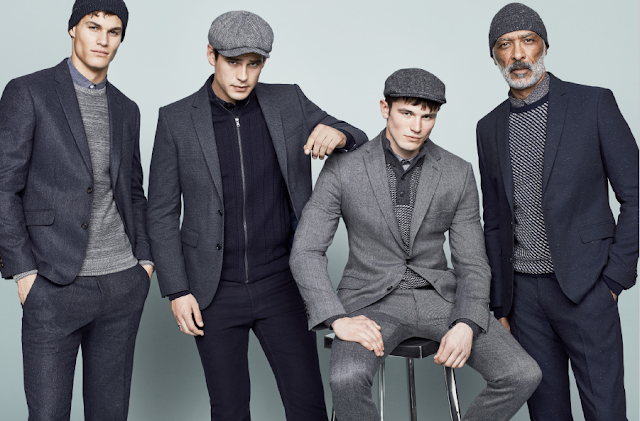 Textured accessories such as baker boy hats and knitted beanies add the finishing touch to looks. Tones for the season include olive, camel, and mushroom with accents of red, purple and green, found across gilets, knitwear and outerwear.